**Click the arrow only Once in the middle of the screen below to view the Gambling Scene! The GAMBLING SCENE is a depiction of what went on on BEALE STREET at PEE WEE'S SALOON that was owned by a 4'5" tall Italian, who was considered the arm wrestling champion of Beale Street. Pee Wee sold liquor and arm wrestled in the front bar of his saloon and allowed illegal gambling in the back room. The gambling scene dramatizes a poker game gone bad at Pee Wee's saloon. ***Click the arrow only Once in the middle of the screen above to view the Gambling Scene! 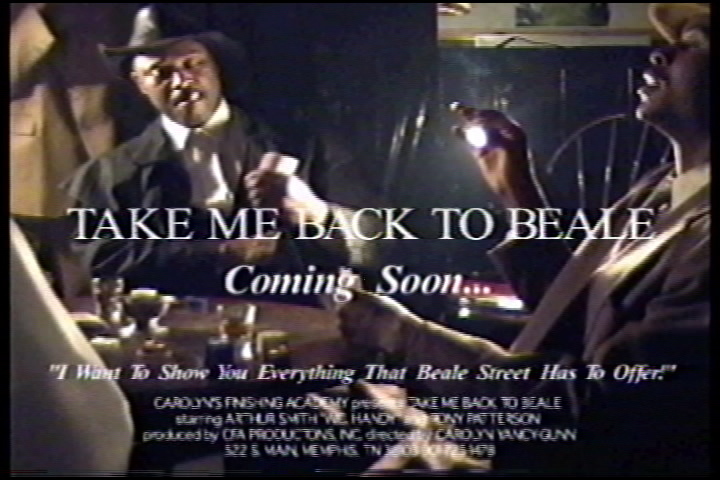 ***Click here to view a Trailer of "TAKE ME BACK TO BEALE"! ***Click here to view a scene from our 4th feature film, "ESTHER"! Copyright © 2019, Carolyn's Finishing Academy/CFA Productions, Inc.. All rights reserved.